ISR is providing preliminary communications backhaul analysis for all NJ Transit routes, including integration with existing microwave backhaul system covering existing routes and system expansion projects such as Portal Bridge, Bergen-Passaic line, and Northern Branch? 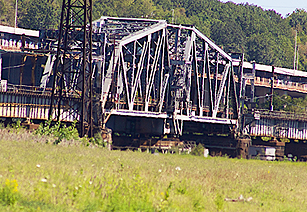 The existing Portal Bridge is a two-track movable swing-span bridge that was constructed by the Pennsylvania Railroad and began operation in 1910. The aging Portal Bridge, now owned by Amtrak, is a bottleneck along the Northeast Corridor that conflicts with marine traffic and impedes efficient and reliable passenger rail service. Given the Portal Bridge’s age, the structure is nearing the end of its service life. ISR has been working with the construction management development team for the NJ Transit Portal Bridge. ISR’s focus has been the development of the Amtrak force account direct and indirect resources and staging plan. This significant effort involves replacing the existing bridge with a new two-track northern bridge.